With all the amazing claims that toothpaste manufacturers make, it’s hard to know what to look for in a toothpaste. Choosing the right toothpaste is integral if you want to avoid a life of expensive and painful dental work, so how do we choose the right one? The one thing everyone should look for in a toothpaste is fluoride. 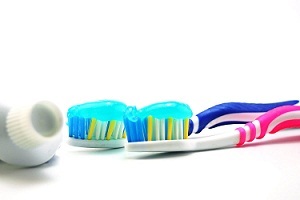 Fluoride helps to strengthen teeth, and protects them from cavities. Although many neighborhoods have fluoride added to their water supply, toothpaste containing fluoride is essential for proper cavity prevention. Whitening toothpastes help remove stains from teeth with special chemicals that scrub stains away. Although these toothpastes can be effective whiteners, they can also weaken tooth enamel and make teeth vulnerable. Be careful using anything too harsh on your teeth. All natural toothpastes are under the same scrutiny as other all natural cleaners, although some swear by certain brands. For anyone suspicious of using chemical cleaners in their mouths, make sure you pick an all natural toothpaste that contains fluoride, or make sure you’re getting it from another source. Whatever you are looking for in a toothpaste, make sure you trust your own judgment. If a toothpaste makes your mouth feel clean, and keeps your breath fresh, then it’s probably working just fine.